EVS is enabling multi-cam viewing of VOD events where viewers can even select their desired camera angles over the C-Cast SaaS platform. Choosing the camera angle you want to watch in a sports match, concert performance or any live VOD event is now possible from EVS with its cloud-based C-Cast platform and during the IBC convention they were demonstrating how it worked with digital media specialist and global sports business leader deltatre. Together they’ve combined it with deltatre’s DIVA online sports video player to create the new “Beyond TV" experience. That means everyone at home with a digital display becomes the director of their own video entertainment. If you want to concentrate on the quarterback of a football game, or the tenor of a opera, the camera selection is up to you. So far EVS has been offering HD resolution on its C-Cast platform, but the whole workflow is gearing up for 4K to follow the latest media trends. 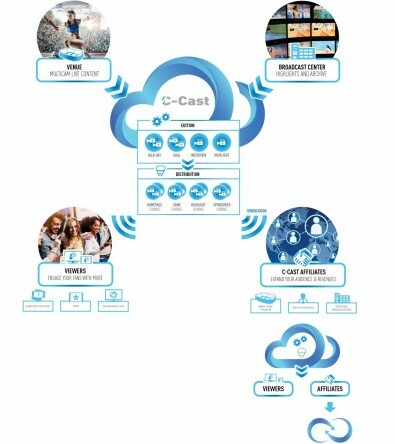 C-Cast will help drive a range of services including web and mobile app solutions enriched with deltatre's enhanced video player for live and VOD streaming, along with match results, game statistics and editorial content. There will even be replays! The final cost to the end user will depend on the marketing entity that provides the content, but a new Apple TV app was also showcased at IBC as part of deltatre's OTT offering, incorporating football coverage in a new, "Beyond TV" experience.